If you cannot make the drive into Red Rock Lakes Wildlife Refuge but would like to see some wildlife, try Wade Lake. This turquoise lake is about six miles west of Highway 287 via Forest Service Road 8381 (find this road just north of where Highway 87 joins Highway 287). Designated as a Montana Wildlife Viewing Site, the lakes are an exceptional area. 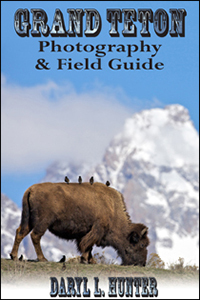 Some residents include moose, deer, antelope, black bear, beaver, and bobcat; grizzly bears are also sometimes seen. Both the serious and casual birder will be astounded by the quantity and quality of birding opportunities. Bald eagles and osprey nest can be seen around the lake. Watch the branches of old growth firs for great gray owls or look to the skies, shorelines, and lakes to see sandhill cranes, hawks, and trumpeter swans. All seasons are good for viewing, but in winter Wade Lake stays partially ice-free, providing excellent habitat for wildlife and waterfowl. 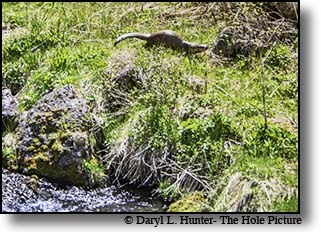 Dropping into the lakes from the Idaho border access I was surprised to find a river otter working the trout spawn ot tine Horn Creek. Cliff and Wade Lakes sit on a geologic fault tucked into the Gravelly Range of the Beaverhead National Forest that formed a chasm that filled with water; cliffs surround much of the lakes' shorelines. Hikers can learn something of the flora, fauna, and geology of the area on a 0.7-mile interpretive trail connecting the Wade Lake and Hilltop campgrounds. Signs throughout the trail delve into the diverse natural processes which affect the landscape. Some of these are lightning, fire, canyon forming, and slope aspects. These processes take place everywhere, and after the walk you will be better able to notice and understand nature at work. To get the full wildlife experience, you’ll need a boat. As you venture further from the boat launch at either lake, animal sightings become more frequent. Cliff and Wade are a flatwater paddler’s dream. Both Wade Lake and Cliff Lake settings are spectacular. The lakes are a closed system and have no outlet; Cliff Lake is fed by three feeder streams then sinks into an aquifer that re-emerges as Wade Lake's spring, what a spring. The two sit about three quarters of a mile apart in the Beaverhead National Forest northwest of Yellowstone National Park at about 6,300 feet. There are four forest service campgrounds. Getting to Wade and Cliff lake can be very difficult coming from West Yellowstone. But it’s not because of the roads; it is because the Madison River runs along the highway because seeing the Madison River can be quite tempting for any fishing maniac. Trout can be seen cruising in the crystal clear still water, feasting on insects. Fishing the lakes requires nothing special. Typically you'll see fly-fishing, spin casting and trolling. 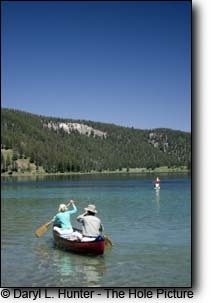 Fishing from boats, canoes, and float tubes are the most successful methods on the lakes. Wade lake has earned a reputation for large Rainbows and German Brown trout. 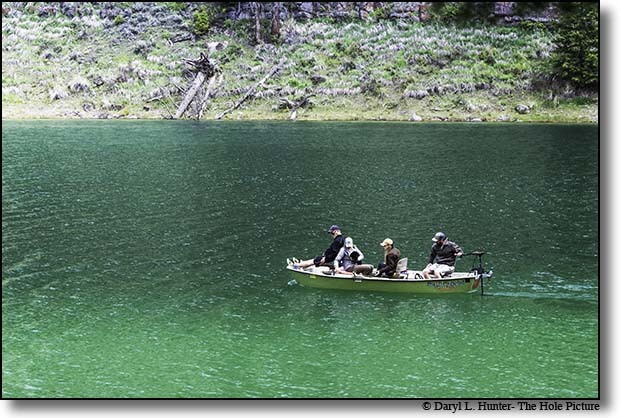 Wade Lake still holds the Montana State record brown trout at 29 pounds. A newly developed spawning channel is an excellent place to view rainbow trout. Hatches: Caddis, Stoneflies, Leadwing Olive, Gray Drake, Brown Drake, Green Drake, Pale Morning Duns and Chironomid. Cliff is a great lake, but Wade is the true gem of the two. 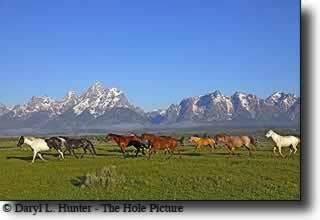 It is where the monster browns were taken many years ago, and where throngs of nice trout are taken every day. 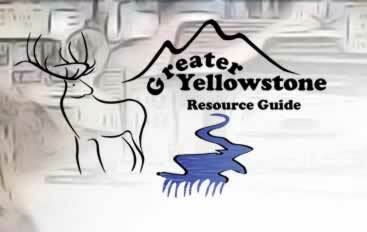 Other regional Gravely Range treasures include Elk, Hidden , Goose and Otter lakes just to the south of Cliff and Wade; all produce well in the summer, and are even further out of the way than Cliff and Wade. The lakes also can be a great place for cross-country skiing in the winter.